No question….I am an addict. 100%, utterly an addict of my morning eating routine. I should be sad about missing out on other things, I know. But I am NOT! I adore the nutritional content, the comforting tastes and textures of my morning and how good it feels to start the day this way. OH, HOW I LOVE MY MORNING ROUTINE! Plus, this addiction is not inhibiting my life or hurting others. So, I think I am good, right!? I wake at 5am, roll outa bed, brush my teeth and step into my workout clothes. No need for more details here, right? As soon as I hit the kitchen, I warm a small cup of water and squeeze some fresh lemon into it. It’s cleansing…in more way than one, if you know what I mean! Sometimes, if my tummy is talking to me, I eat a Medjoule date or a SMALL banana just to tide me over through my workout. *Please keep in mind that I am not training extremely hard in my exercise routine. I workout for health, energy and sanity. So, unless I am feeling very hungry, I do not eat a big snack before I exercise. I still have reserves from the day before that can be burned as fuel....and, most likely, so do you. After my workout, I go upstairs to start my girls on their day’s preparation. As I hit the shower, I’m sipping a Kombucha (a fermented drink filled with enzymes and probiotics…more on that later). The three of us return to the kitchen where I feed the girls a healthy breakfast and I prepare my green smoothie (which has likely been prepped for already—see this post for my preparation tips). I’ll post more about my green smoothie on another day. Patience, now…one step at a time! I drive my girls to school and when I return to my computer or before I meet with a client, I eat THIS…what you have been waiting for! 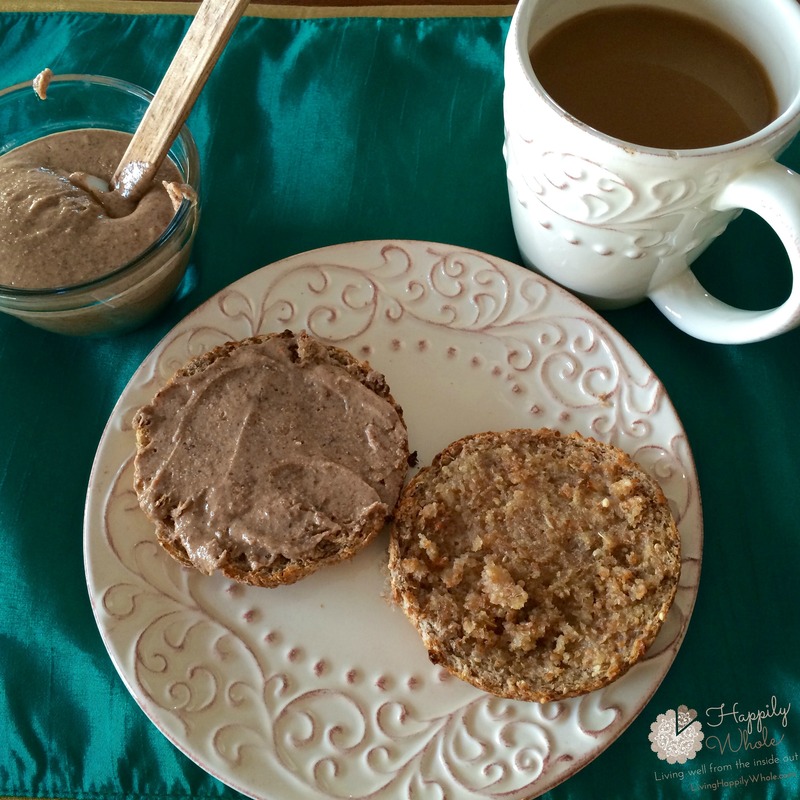 An Ezekiel English Muffin (found in the freezer section with other natural foods) with grassfed butter slathered on one side and homemade almond butter on the other. Yes, sometimes I have a muffin or even toast instead. But, most days, it’s this little ditty I adore. I eat my English muffin ritualistically sipping coffee between bites. Ohhh, yeah! Love it. I drink organic, fair trade coffee with a touch of coconut creamer or an organic (GMO free) vanilla soy creamer. I’ve also made my own decadent creamers, which I will share in the future. *Purchasing organic coffee is IMPORTANT because it's a heavily sprayed crop. And be sure to go the extra mile and get fair trade to support healthy farming conditions. We don’t know the abuse some people take for little pay in return for our consumption. Now, let me be clear: You CAN buy almond butter (I suggest RAW almond butter so that it’s unpasteurized and the enzymes and nutrients are all still intact). I make my own because I love the flavor, it’s more cost effective and the extreme freshness. But, if you’re not the almond-butter-making-type you can find yourself a favorite variety at the store. You can also substitute with an organic peanut butter (or any other nut butter) but please READ LABELS to ensure there are not a lot of unnecessary added ingredients like oils, sugars and preservatives. Okay, now on that note, I will tell you just how easy it is to make the almond butter I use most often. I think you’ll be surprised. Even as I think about sharing this, my mouth is watering and I’m excited to hear how this easy-peasy recipe works for you! Preheat your oven to 225° and spread almonds on to a dry baking pan. Slightly roast the almonds for about 15 minutes. This allows for the oils to be released more readily during the processing step. Plus, I enjoy the flavor better. Keeping the oven temperature low avoids damaging any nutrients. Let the almonds cool slightly. Put the almonds, coconut oil and salt into the food processor. Press PLAY! Let the mixture process until you notice the sides need scraping down. When necessary, stop the processor and scrape the sides. Then, continue processing. You will need to do this a few times and total processing time can be up to 8 or 10 minutes. Just watch your butter. The mixture will get crumbly, form a ball and eventually form a nice creamy butter. The mixture gets warm in the processor so I suggest letting it cool before packing it into a glass jar/container. Refrigerate your almond butter and enjoy it every day! Often, I will make a double batch in order to fill a larger jar. 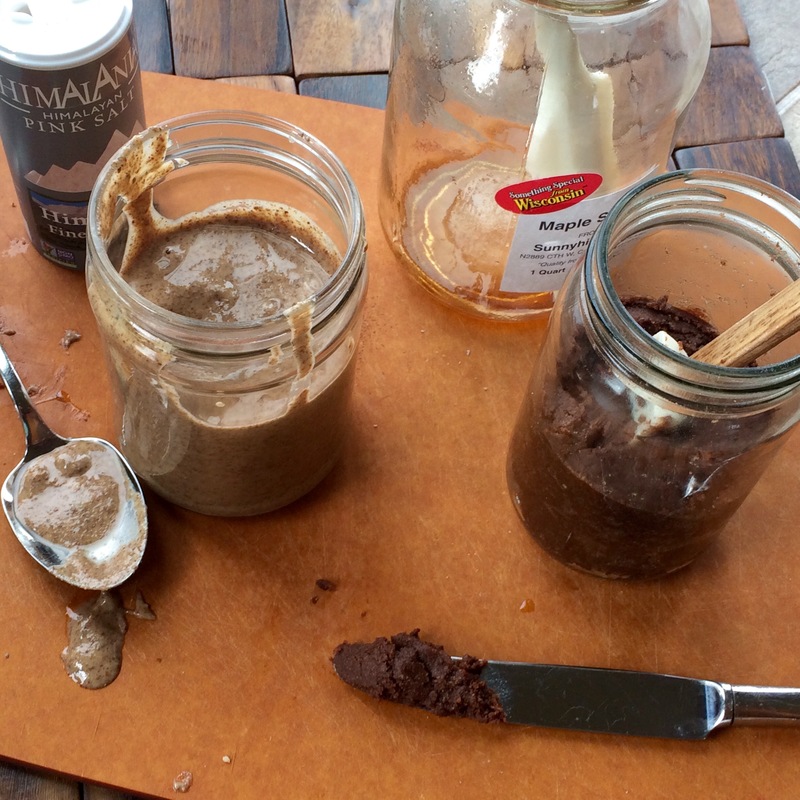 Variation: Chocolate, Maple Flavored Almond Butter. To make this version, simple follow ALL of the directions to make My Favorite Almond Butter. Then, to your food processor, add 2 tablespoons pure maple syrup and 2 heaping tablespoons RAW cocoa powder. I also added an additional teaspoon of coconut oil. Process until smooth. Taste it. If you like it a little sweeter, add a bit more maple syrup. But don't get too carried away! Remember, this IS a healthy food that we can eat on a regular basis! Coconut Oil. I prefer unrefined.